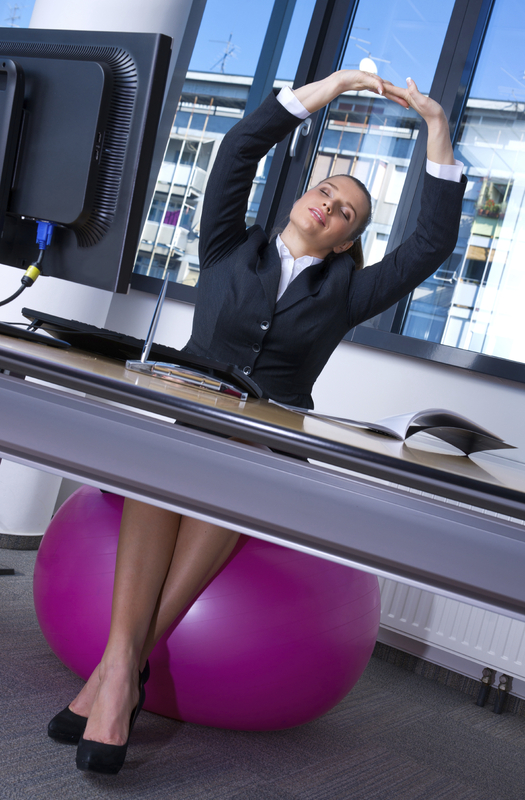 Use a stability ball as a chair at your desk to keep good posture. No more excuses, workaholics! It’s time to put the same amount of dedication towards your fitness goals as you put towards your career. Sure, it’s difficult to make time for a workout when you have to get to work early, stay there late or travel. And there’s only so much time in a day to complete the many other important tasks on your to-do list. But there really is no need to dedicate hours of your time at the gym to get in a good workout. There are ways to integrate fitness into your daily life without drastically altering your schedule. Pack up some fitness equipment and take some time during your lunch break or in between meetings to get in a quick workout. For many exercises that you can do on the go, you won’t even need equipment. As a fitness trainer, I’ve had the opportunity to use many different types of equipment for myself and while training with my clients. I’ve seen some great results with TRX Suspension Training. It’s a wise investment for anyone, no matter what your level of fitness is, and it’s especially beneficial for individuals on the go because it’s easy to transport and store so it can be used just about anywhere. It’s also very effective for those trying to maintain consistency with their workout schedule. I’ve used it in many places, such as my home basement, my gym, hotel rooms, the park, and in the homes and businesses of my clients. I primarily use it for improving my flexibility, range of motion and core strength, and maintaining my overall physicality. I also use it to diversify my routine and add some dynamic to my workout. Strengthen your muscles when you’re on the go with these quick exercises. Complete a few sets before you head out the door, when you get home from work or even at the office. 1. Dips: Put two chairs together a little more than shoulder width apart. Place yourself in an upright position with your hands on the chairs without letting your feet touch the floor. Have your elbows bent at a 90 degree angle. Push yourself back to the upright position. 2. Pull-ups: Invest in a workout bar to do pull-ups. Workout bars are portable and easy to use – just find a door frame to place it on and you’re ready to go. 3. Sit-ups and crunches: You can do sit-ups and crunches right on the floor or use a stability ball. While you’re not using the stability ball for core exercises, you can use it as a chair at your desk. It’s great for keeping good posture. 4. Hip extensions: Strengthen the hamstring and gluteus muscles by doing hip extensions with a resistance band. Tie one end of the band around something sturdy at ankle height and tie the other end around your ankle. Shift all your weight to the leg without the band. Keep your body stable and straighten the leg with the band behind you. Return to the starting position. 5. Jump rope: You can burn over 100 calories in 10 minutes by jumping rope. Find an area with space, grab your jump rope and start jumping! It’s never too late to start integrating fitness into your life. There’s always time to get in a workout or even just a few exercises. You really don’t need more than 30-40 minutes to achieve your fitness goals. Make the most of your training time by focusing on your objectives. Your health is just as important as your career or any other aspect in your life, so try and make it a priority.